This garden, filled with a maze of grey brick arches interspersed with willow trees, has been completed by Martha Schwartz Partners as part of the 2011 Xi’an International Horticultural Expo currently taking place in China. Master Designer's Garden Plot 6 is one of nine gardens designed under the theme 'the harmonious co-existence of nature and the city'. The impression of endless pathways and arches is created by mirrors fixed to the brick walls, which on finding the dark exit corridor are revealed to be one-way glass, allowing a view back to those still lost in the maze. Over 1,000 small bronze bells hang from the branches of the willow trees, which chime in the breeze. Photographs 1-3 are by MSP. Photographs 4-11 are by Gen Wang. Photograph 12 is by Jake Walker. MSP was one of nine international landscape design firms to be invited to design a small garden installation on the theme of “the harmonious co-existence of nature and the city” at the 2011 International Horticulture Exhibition in Xi’An, China. The garden will be seen by up to 12 million people between April and October 2011 and may by left permanently as part of the legacy strategy for long-term development of the site. This project is commissioned by Xi'an International Horticultural Exposition Organizing Committee. The owner’s brief specified that the designer should consider the limitations of local building materials and methods, and that the garden should be accessible to the Chinese point of view. Plot 6 measures about 30 meters square on a flat site. The garden is composed mainly of only four elements: traditional grey brick walls and paving, willow trees, mirrors, and bronze bells. The exit corridors are covered with a flat steel and rubber membrane roofing system. The theme of this installation is “City and Nature”. It is a simple theme that allows many interpretations. The bottom half of the garden is made of brick and is a maze of hallways and corridors. The city has a roof of green. The “city” is entirely walled by simple, 3 meter high brick walls that seem to have no entrance. One enters the “city” through two ends of an open hallway created by a blank but totally mirrored wall facing a façade of 5 archways. These archways penetrate 1.5 meter thick walls and connected to a series of corridors. The numbers of possible archways to move through increase as one begins to walk through the space, creating a situation where people must begin to choose where to go and what route to try – an endless choice of routes through the maze. At the same time, no one quite knows where they are going and what to expect. It creates an experience of fun, discovery and perhaps some anxiety. These thick archways lead to perpendicular hallways, none of which are parallel, resulting in a strange dislocation and signalling that things are not quite normal in this environment. The hallways are all mirrored at their ends creating a doubling of these spaces and corridors that bend and sometimes seem to go into infinity. As one goes through the doorways and hallways, some of them lead to “dead-end” rooms that are completely mirrored spaces and immediately remove you from the bricked environment. If one continues deeper into the maze, you come to a mysterious grove of willows, an illusion created by a 3-sided room with mirrored walls that endlessly reflect the willow grove to create a sense of endless forest. As one starts to go down the exit corridors, it is only then that the real surprise of this garden is revealed. The mirrored surfaces are all 1-way mirrors allowing the people in the corridors to watch all the people moving through the maze and in the mirrored rooms. The viewers are able to watch the others perform without the people in the maze knowing. This arrangement provides endless entertainments, quite like the currently popular “reality” TV shows, and allows the viewers a vicarious view to performances and amusement thanks to the people who are performing completely oblivious to the fact that they are being watched. The only thing that is more amusing than looking at ourselves, is watching others when they don’t know they are being watched! The corridors are a “fun-house” where people laugh and photograph the performance in the maze from the sides. At each end of the transverse corridors are mirrored walls which create an illusion of infinite space. 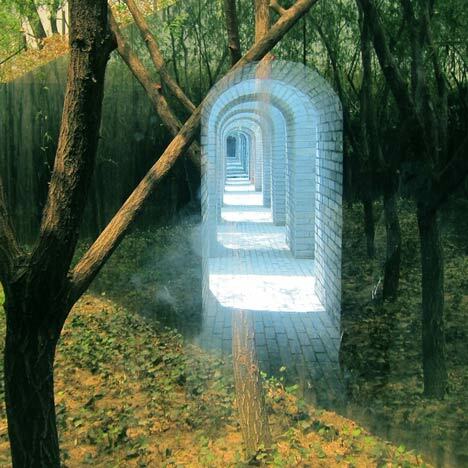 As one penetrates the last of these corridors, one enters a dark, enclosed exit corridor and is confronted with a wall of one-way mirror facing a mirrored garden room with a grid of willow trees and bright green groundcover that seems to go on forever. Exiting via one of two dark covered corridors, one discovers that many of the mirrors they had encountered on the way through the transverse corridors are actually one-way mirrors, through which they can observe others from the hidden dark corridor. The combination of living willow and solid grey walls is an expression of the harmonious co-existence of nature and city. The garden is a minimalist work of contemporary land art that speaks to the antiquity and timelessness of China, the flexibility and durability of its culture and people. It is Ying and Yang, light and heavy, dynamic and eternal, masculine and feminine. It is rich by its own simplicity. Everybody can sense it in their own way.